This is the English translated edition for the original Japanese art book ストリートファイター4/スーパーストリートファイター4 オフィシャルコンプリートワークス which I reviewed earlier. So, this review isn't going to be too different. This artbook collects the character sketches for the Street Fighter characters for the two games, not including the Arcade Edition. You'll see the character splash art as well as concept sketches of different costumes. Some characters have more coverage than others. Other materials included are the ending animation screenshots, background designs, some ads designs of characters selling food, storyboards and an interview with the producer. This book is not as good as the few Street Fighter art books before, namely SF20: The Art of Street Fighter and the fan art book Street Fighter Tribute. If you don't want to get all the Street Fighter books, I would recommend SF20 and the refreshing Street Fighter Tribute, both at 320 pages. As with Udon books, I would pay special attention to the binding. Mine seems alright at the moment. The book's a 176 page paperback. 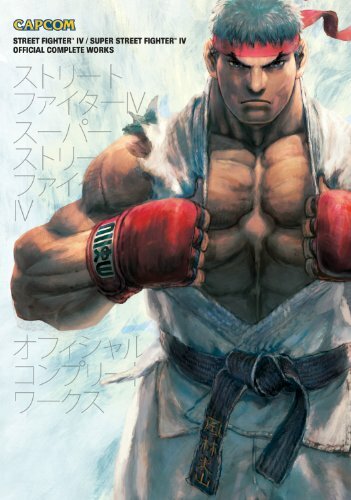 I have to say, this was my first Street Fighter art-book (ironic as I got back into the series with SSIV), and I genuinely enjoyed it. I liked reading some of the (admittedly brief) design notes on the challenges of adapting characters for the 3D format, and it's really cool to see some of the designs that didn't make it through and the alternate costumes for each character. It's also nice to have on hand to have a full collection of the various pieces of character art. I'm not terribly fussed about the Tribute book, but after this, I think I'll be getting the SF20 volume. So whilst it is rather slim, I think it's a decent collection - and it fits snugly next to my Megaman Battle Network Complete Works volume. Can't wait for Udon to get the Shigenori Soejima Persona collections out. Hi Parka, I read on amazon that the English version has more content than the Japanese version, including the Super SFIV chartacters. Is that true? English and Japanese both have same amount of content. It includes SSFIV characters, but not those from the AE release after that.